Taipei, March 4 (CNA) The possibility of aftershocks cannot beruled out for a month after a 6.4-magnitude earthquake -- the biggestin the south of the country in a century -- that rocked southernTaiwan Thursday, according to seismologists. The quake, centered in Kaohsiung County, about 300 km south ofTaipei, struck at a depth of 5 km, making it a shallow earthquake.The immediate cause of most shallow earthquakes is the sudden releaseof stress along a fault, or a fracture in the earth's crust, said LuPei-ling, deputy head of the Central Weather Bureau's (CWB's)Seismological Center. Shallow earthquakes are more damaging than deeper earthquakes dueto there being less rock to absorb the shaking, and they tend to havea lot more aftershocks. Therefore, there is a possibility thatKaohsiung could be hit by aftershocks of at least magnitude 5, Luadded. Since the earthquake on Thursday morning, several aftershockshave shook the area, with the biggest one -- magnitude 5.7 --occurring at 4: 16 p.m., 17.1 km southeast of the 6.4 quake'sepicenter. The earthquake was the most powerful to hit Kaohsiung since 1900,Lu said. 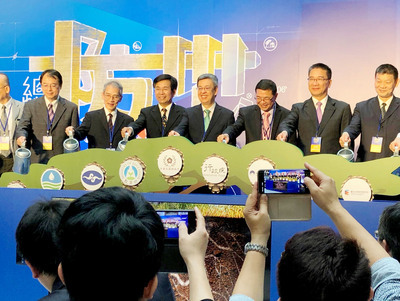 CWB Director General Shin Tzay-chyn said Thursday's quake wasrelated to the Chaochou Fault in Pingtung County and was caused bythe movement of the Eurasian Plate against the Philippine Sea Plate. Although distance cannot be used to establish the relationship toa quake, the epicenter was only 8km from the Chaochou Fault, Shinsaid. Lu also pointed out that it is uncommon for an earthquake tooriginate from the Chaochou Fault, as it is considered to beinactive. However, Shih Ruey-chyuan, a professor of the Institute ofSeismology at National Chung Cheng University, dismissed thepossibility that the earthquake was caused by the Chaochou Fault andinferred that it was triggered by a blind thrust fault, which is afault plane that terminates before it reaches the Earth's surface.Because of the lack of surface evidence, blind thrust faults aredifficult to detect until they rupture. The strong earthquake caused panic and fueled local speculationthat there might be an abnormal increase in the frequency of largeearthquakes, given the recent earthquakes in Haiti and Chile,although Shih pointed out that the frequency of quake occurrenceworldwide is still within the normal range. In addition, Chen Yu-kao, a seismology professor at NationalTaiwan University said there was no relationship between Thursday'stemblor and the 8.8-magnitude earthquake that struck Chile Feb. 27,killing more than 800 people.